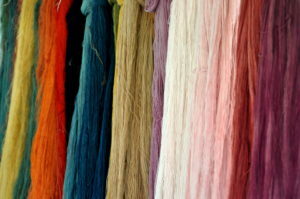 At The Colours of Nature we can dye fibre, yarn, thread, fabrics and garments. Our specialisation is natural indigo fermentation dyeing, using indigo extract from the leaves of the plant Indigofera tinctoria, but we have also mastered many other processes. For red we use use Rubia cordifolia, a.k.a. Indian madder, for yellow and green hues the leaves and the nut‐like fruit of the Terminalia chebula tree, and so on. 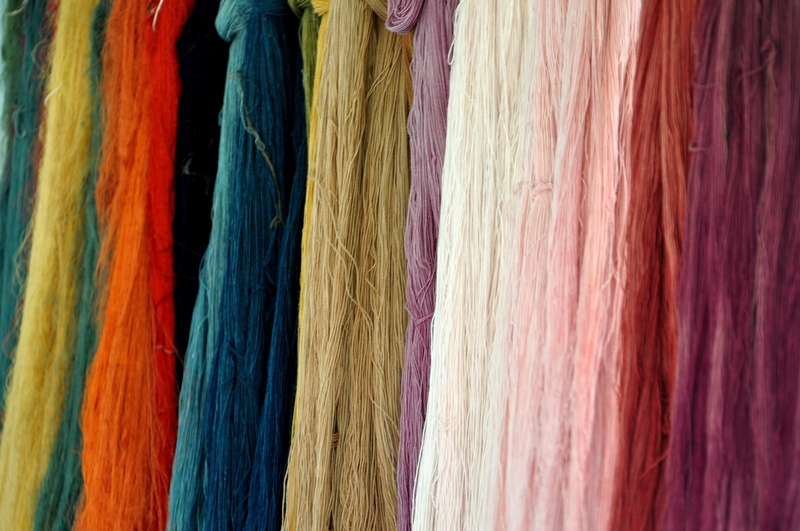 All of our dyeing takes place onsite, as does some of the cultivation and processing of plants. Source materials come from not too far and always from trusted suppliers. So rest assured that we are truly eco‐friendly. Specialising in the ancient natural indigo fermentation process, our palette ranges from a light green to the deepest dark blue. But in addition to indigo, we have mastered many natural dyes and are able to provide the full range of colours. Indian madder twigs give red, whereas for yellow we use Terminalia chebula nuts, Jackfruit tree heartwood or Marigold flowers. Orange and green hues are achieved by mixing, whereas rind of Pomegranate fruit gives khaki, the bark of the Indian gum Arabic tree gives brown and Lac insect secretion provides purple. We continuously play around with different dyes, the thrill of a new discovery equalled only by the satisfaction of ardent work seeing fruition. Find here our Colour Cards for Cotton and Silk. Today, in our opinion, only natural dyes with no added hazardous chemicals are 100% eco‐friendly. We take great care to ensure that crops are sustainably raised and harvested (no pesticides, herbicides, or defoliants; no GM and no unsustainable irrigation). We know our suppliers well and stay clear of adulterated indigo cakes and any added toxic chemicals. All our raw materials are non‐toxic and bio‐degradable. We are one of very few companies not using Sodium hydroxide (Caustic soda) or the more polluting Sodium hydrosulphite (cheaper as less dips are needed) for our natural indigo fermentation process. Being 100% eco‐friendly means less pollution, safer working conditions and preservation of biodiversity. We are GOTS certified via Quality Fiber. Vat dyes like natural indigo need a powerful reducing agent to make them soluble. This leads to the effluent containing 5‐20% of residual dyestuffs plus reducing agents, oxidising agents, detergents and salts. At The Colours of Nature, we only use safe mordants (aluminium salts and ferrous acetate), but even these chemicals need to be treated before being returned to the local waterways. We neutralise them with lime. 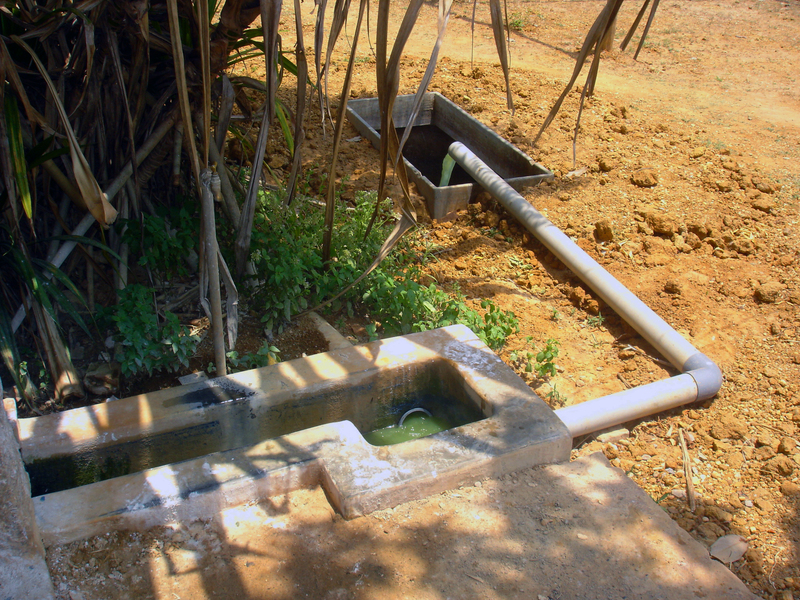 The mixing and settling tanks of our state of the art water treatment system give sludge that is used as manure and water that is reused to water the gardens, which helps combat water scarcity. 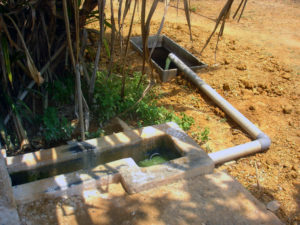 Water scarcity is a real issue in our world today, not least in Tamil Nadu, India, where we are based. Read more on our local situation here.